For customers in our Direct Store Delivery region we provide reliable service to businesses large and small, delivering high quality coffees and state of the art brewing systems. With a dedicated and knowledgeable team, we offer a prompt and accurate delivery supported with an outstanding service department for a complete range of programs. Partner with our dedicated team for all your coffee and hot beverage needs. 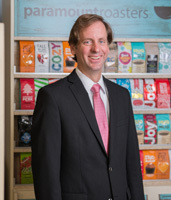 Rich Schaasfma started with Paramount Coffee Company in 1994 as a route delivery sales person. The many titles he’s held and his years of service at Paramount have enabled Schaasfma to develop a keen knowledge rarely seen in the coffee industry.